Right, so Dr Canada once told me to ‘burn off that estrogen’. Forget about fat or calories. I’m burning estrogen. What my husband is burning, I have no idea. He’s six foot five with a slim build. But maybe we could say he’s building up the muscle? Burning on that muscle! And improving circulation, too. All this to say that we’ve found a new way to exercise, which I’d like to recommend to you today. What is it? Snowshoeing! Yesterday afternoon we drove out to a quiet spot in the Ottawa Greenbelt just off the highway, and tried on our (my parent’s) snowshoes for the very first time. Unlike the experiment with cross country skiing (which was, by the way, disastrous) there was no trouble getting into the shoes, and no trouble keeping balance. So we begin to walk into the bush, and we’re determined to find some animals. There are tracks everywhere. Some two-hoofed and spaced, others tiny and very close, a few that are quite dog-like (or wolf-like! ), and others remarkably human. But that’s all we see – tracks. Maybe twenty minutes later we’re crawling through the branches of some thick patch of spiky trees (the best bit of nature walking) and come across a train line. Fan-freaking-tastic, a nice smooth path. Obviously animals and people walk along this line – we can see by the tracks, and obviously no train uses this thing because it’s totally snowed over. Safe to walk on? Of course! So we start walking. Beautiful day, the sky is so blue, the trees have that glisten of a past ice storm . . . and we are stomp, stomp, stomping along till we reach this ‘thing’ I don’t know the proper name for. It’s a light for the train, as though there were once two train lines here, as opposed to one (because the actual lights points off into the forest – i.e. to nowhere and no one, not sure how a train on the main track would even see it.) and at the bottom of this thing is a pile of old seeds. 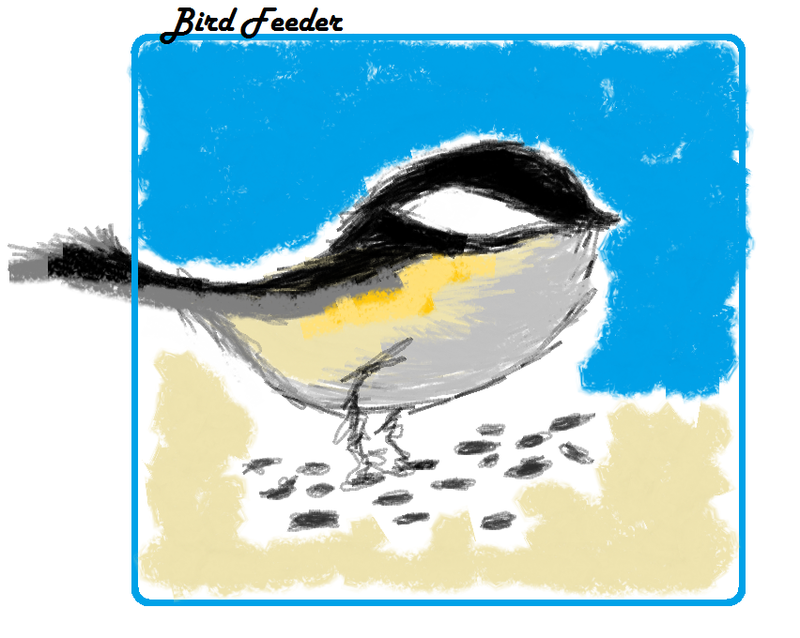 And chickadees. Little tiny, black, grey and yellow chickadees, hopping around and picking at the food. Zsolt pulls out the camera and one of the birds flies onto his camera. We get this on film. And then I decide to try. Roaring down the ‘apparently-not-abandoned’ train track, is a giant plow throwing snow into the air like little waterfalls off its side blades. Because this train line is quite, hmm, narrow? With dips on each side – one side goes quite steeply down into the trees, the other rises quite steeply up in to the trees . . . the stream is on the ‘up side’. What does Zsolt do? Does he follow his panicked wife? Oh, no, he doesn’t. He’s suddenly struck with reason, and simply steps to the side of the maybe-wider-than-I-realized path, and the plow slows down to pass. There I am, clinging to the side of this hill as the plow man looks at me and gives an uncertain wave. . . and they carry on. Leaping across a stream is easy when you’re panicked. Getting back off that steep incline is more tricky. With help from Zsolt’s reaching arms, I managed to jump back across that stream (onto the upward incline of the train line) and back to safety. Anyhow, by the time we walked back to the car, we were both totally knackered. However, in terms of exercise and reclaiming your health (Cause, really, that’s the bottom line despite all the extra life-threatening fun. ), I couldn’t recommend it more. Crazy adventure with snow shoeing, and good health to boot. Totally worth the price of the equipment. And maybe, maybe, next time, we’ll spot a moose.